Lightly oil the pan or spray it with a little non-stick cooking spray then scoop the batter into the pan in 1/4-1/2 cup portions. This recipe is pretty easy to eye-ball. I make it all the time with a big scoop of flour, a spoonful of baking powder, pinch of salt, stevia and enough water to form a thick batter. 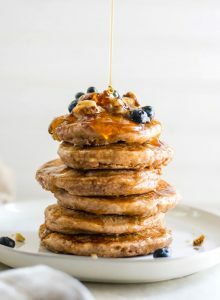 It makes amazing, perfect, super light fluffy vegan pancakes every time! For best results, make sure you active baking powder. If you’re unsure if your baking powder is still good, you can test it by by mixing 1 teaspoon of baking powder with 1/3 cup hot water. If the baking powder is fresh, the mixture should produce lots of bubbles.